There’s a new place in town for dim sum, and it is fabulous. I’ve been here for dim sum four times now, and it has yet to disappoint. My friends Diane and Nancy were the first people to tell me about it, and they were there within 24 hours from when it opened. I was so glad they talked about it, because it is now one of my favorite places downtown. The staff is friendly, the food is delicious (and plentiful), and the prices are almost criminally cheap. 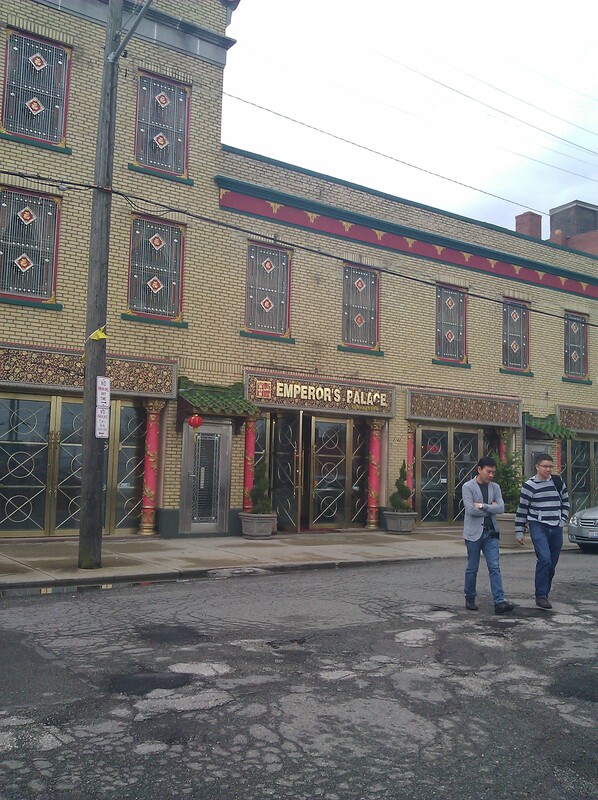 Emperor’s Palace opened in Cleveland’s former Chinatown area, on Rockwell Avenue between E 21st and E 24th Street. The restaurant seems like it spans the entire block, but there’s only one set of doors to enter through (and hint: the right door is always locked and is the one I always go to first). Free parking is available along the street as well as in the huge parking lot across the street, which is lined with statues of the Chinese zodiac. 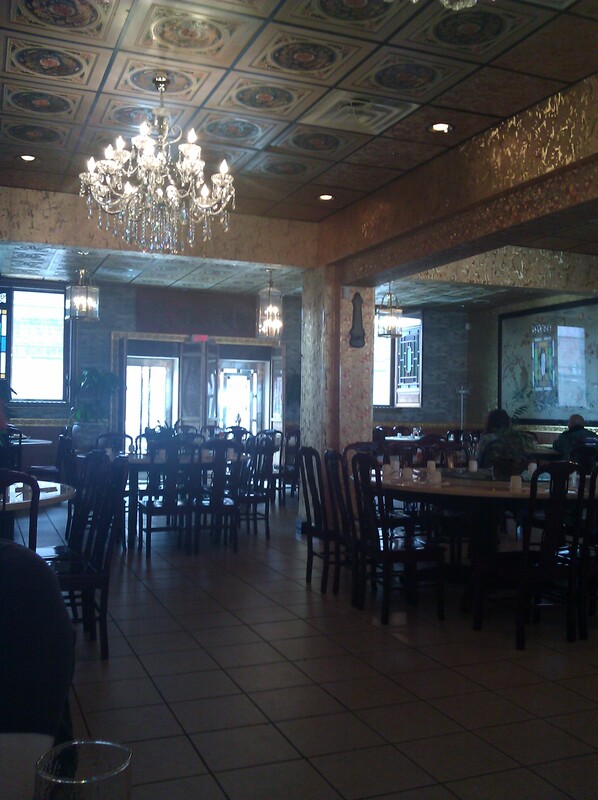 The decor is ornate, with lots of gold trim and chandeliers. They used to have a buffet table in the center, but they seem to have decided to focus on their dim sum and made-to-order food. The dim sum here is served differently. Most dim sum places serve their dim sum from carts that are wheeled around the room, but Emperor’s Palace chooses to bring the entrees fresh from the kitchen, ensuring that the food is piping hot. The food is ordered and then brought out as soon as it is ready. 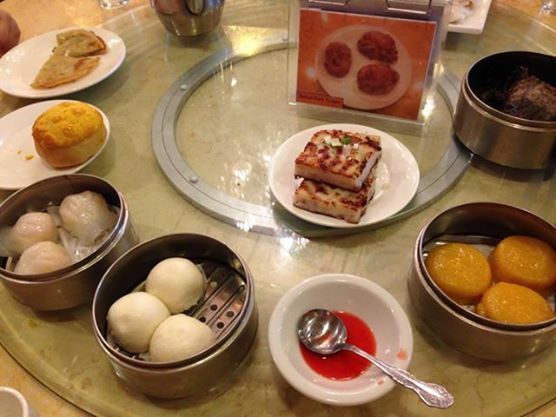 Dim sum is always best when shared with several people – and especially fun when shared with a larger group because you can try more things and send them around on the lazy Susan in the center of the table. I met several friends today for lunch. We feasted on eight different dim sum plates, and splitting the bill (including a generous tip) between the four of us gave us a grand total of $9.50 a piece – and we brought some leftovers home with us. My favorite things on the menu are the steamed shrimp dumplings, the turnip cakes, and the sticky rice with preserved meats. The BBQ pork buns were also requested by a member of our table, and my Chinese-American friend G. and the waitress decided on several other plates for us (in Chinese so we were pleasantly surprised with some new things). 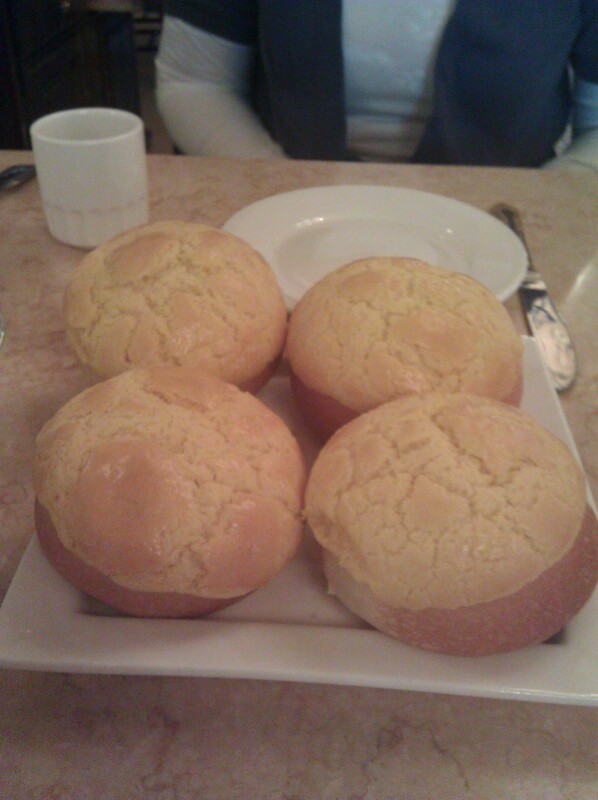 We started off with the pineapple buns, which were something that G. didn’t realize she had ordered, but were loved by everyone at the table. The dough was light and pleasantly yeasty, and the crust was flaky and delicious. The pineapple was not overpowering and simply delightful. I will definitely be ordering this again – perhaps as the finishing touch for dessert. The waitress also brought out a Century egg porridge/congee that G. requested since her grandmother used to make it. The waitress was unsure we would like it, and – although we assured her we would gladly try anything – she was right. It was deemed too bland by the rest of us, so I don’t think I would order this again. G. got to take several servings home with her to enjoy for breakfast this week. I never really enjoyed turnip cake until I tried the one at Emperor’s Palace. Now I’m hooked. I’m always tempted to order a second order to go at the end of the meal to enjoy at home. 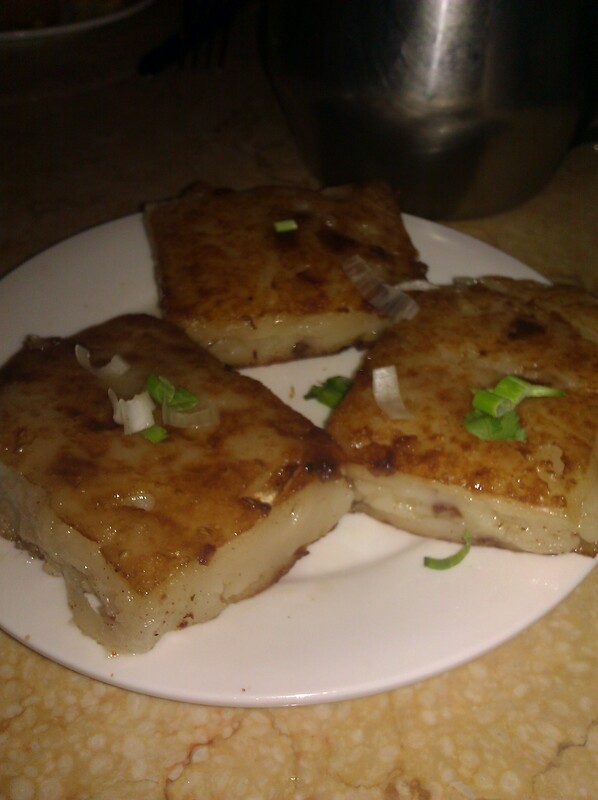 Their “turnip cake country style” features dried shrimp and pork, which makes it extremely flavorful and fresh. The turnip is delicate and flaky with a nice seared crust on top. The size tends to vary every time I’ve been here (the cakes are getting smaller), but the flavor has never disappointed me. They also reheat really well at home. The Emperor’s steamed shrimp dumplings are addictive. I seriously crave them after I leave as well as the next day. They are little delicate clouds of rice dumpling encasing a succulent shrimp filling. I can’t even begin to describe them without swooning. They are *that* good! 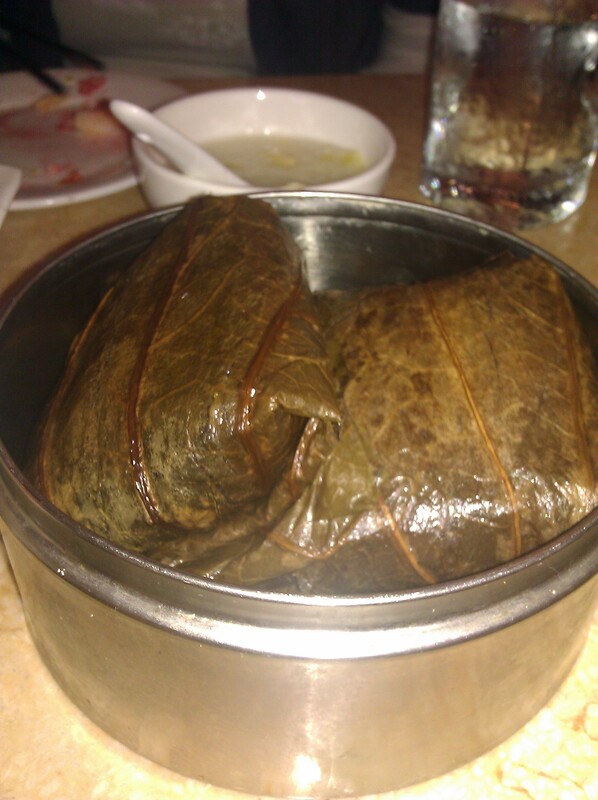 Another favorite of mine is the lotus leaf wrapped sticky rice. I love the delicate scent the lotus leaf gives to this dish and have always enjoyed it at other places that serve dim sum. The one at Emperor’s Palace is just bursting with a variety of meats, including pork, shrimp, chicken, and sausage. It is extremely filling, and three of us split one of the two wrapped packages in the order. I took the second one home to reheat for dinner tonight. 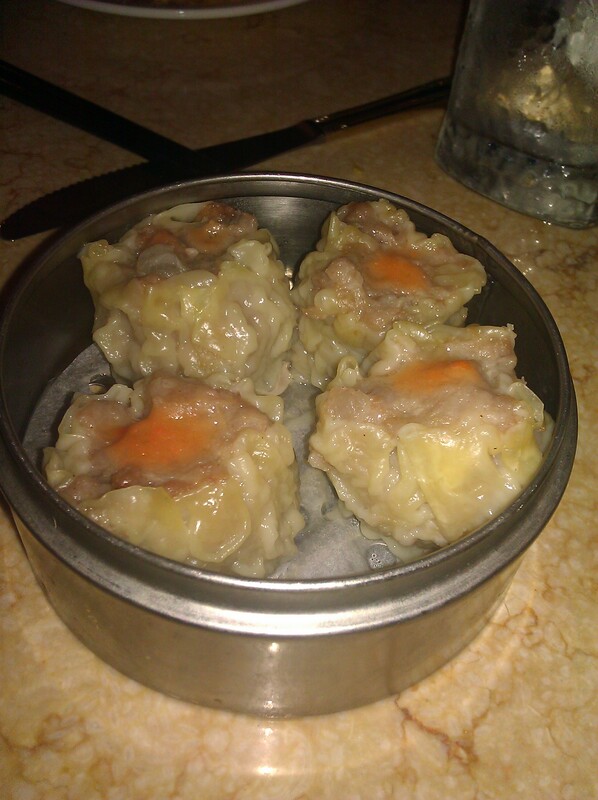 Their “Sao mai” (aka sui mai or shu mei depending on the translation) is dense and flavorful. 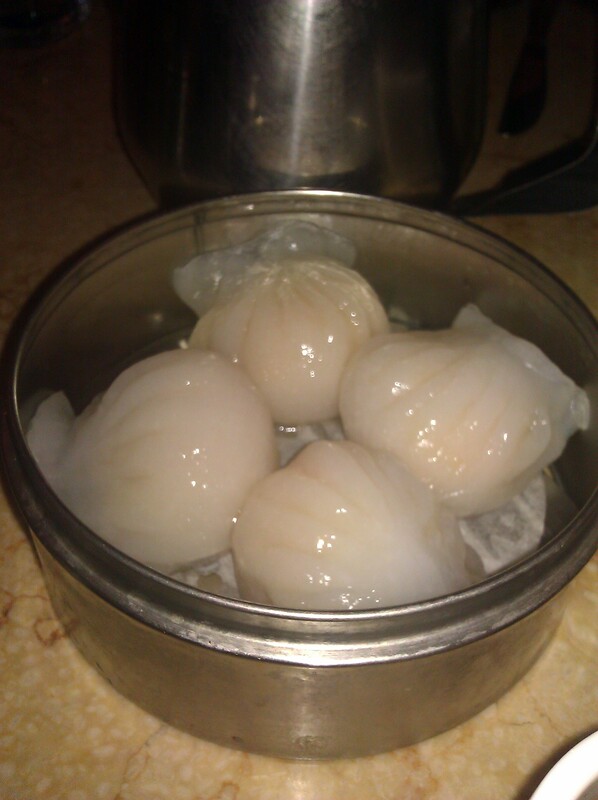 It is a two-bite dim sum delicacy. I have enjoyed it both times we have ordered it. Everyone loves the BBQ pork buns, but I have never been a huge fan. The BBQ pork buns here are light and fluffy, and the filling is flavorful. If you love them I’m sure you will be delighted. I am not including a photo here (my photo came out blurry), but you can see them in the photo below peeking out from behind the Shanghai juicy buns. We went early today, because G. really wanted the Shanghai juicy buns and they have always been out of them when we’ve been there later in the day. We met at 11:30 (they open at 11) and were able to enjoy these little round nuggets. 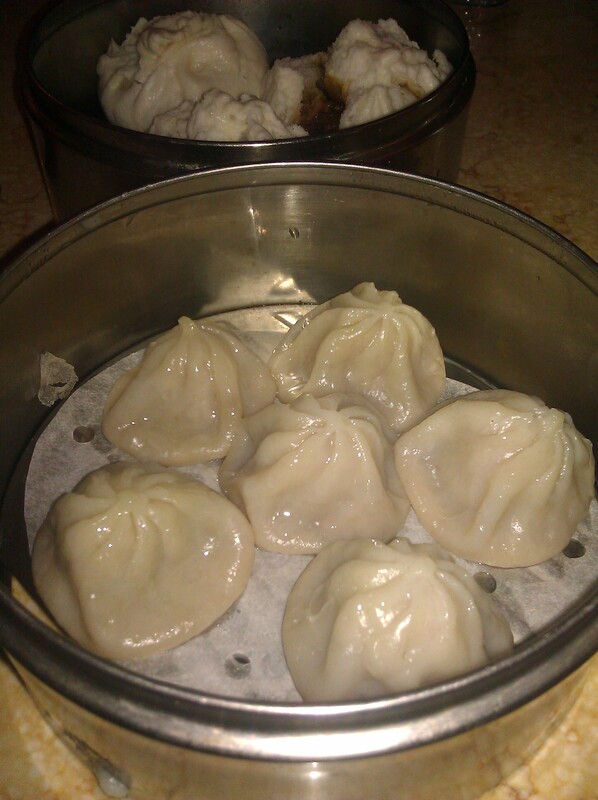 Emperor’s Shanghai soup dumplings are golf ball-sized buns that contain a filling of pork (and sometimes crab) and about a tablespoon of broth. When properly made, Shanghai juicy buns are really juicy, so they are definitely to be enjoyed in one bite. The proper way to eat it is to bite off the top of the bun and blow into the hole to cool off the soup, then either pour some of the accompanying gingered rice vinegar (be sure to say yes when asked if you want the sauce with it) into it. Or you can do as I did and dip it in the sauce and stuff it into your mouth so that when you bite into it the juice doesn’t spurt out all over the front of your shirt. Shanghai juicy buns are very labor-intensive and it’s not easy to make the skin paper-thin and stuff the dumpling so full of juice, so if they have it that day I highly recommend giving them a try. Other dim sum plates I have enjoyed here in the past (but didn’t take photos of) include the scallion pancakes, pan fried pork dumplings (which we were given by mistake because it was supposed to go to another table – our gain! ), fried cruller rice crêpes, sesame pork buns, tofu skin (surprisingly delicious!) and pumpkin cakes. We are always too full to order the egg custard tarts at the end. For more photos of Emperor’s Palace, check out my friend Edsel’s photostream on Flickr. My go-to person for excellent Chinese food, Nancy of Fun Playing with Food, also has some great pictures of some other dim sum dishes and entrees on her blog post on Emperor’s Palace. Maybe one of these days I will actually order an entree here, but when the dim sum is so delicious and flavorful it is hard not to stick with what I love.